Pokémon Pinball: Ruby & Sapphire (ポケモンピンボール ルビー&サファイア, Pokémon Pinball: Ruby & Sapphire?) 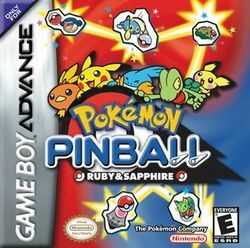 is a pinball game based on the Pokémon Ruby and Sapphire game for the Game Boy Advance, and is the sequel to Pokémon Pinball for Game Boy Color. This newer sequel has more Pokémon in it that are based on Ruby & Sapphire. The game follows the same Pokédex as Ruby & Sapphire and has all the Pokémon from those games. The game feels very similar to Pokémon Pinball, only it is more polished and more improved than the older game. The game has two boards and loads of Pokémon to catch as well. This page was last edited on 7 September 2015, at 21:44.